Modern replacement materials can put an end to most common maintenance concerns associated with traditional wood siding, and they will also boost a home's aesthetic appeal and add value. Vinyl siding, first introduced in the mid-20th Century, is a top option to protect your home from pests and the effects of weather; it's durable, cost effective, and available in myriad styles and colors. According to HomeAdvisor, costs for vinyl siding installation nationwide typically run between $5,600 to almost $14,000, with an average of about $9,500. Material costs vary based on thickness, style, details, and home size, and labor costs vary with design complexity and trim options. Overall, however, vinyl is a cost-effective option, and the job can be completed by a motivated, moderately-skilled do-it-yourselfer. A downloadable manual compiled by the Vinyl Siding Institute offers invaluable information and complete installation tips. A manmade plastic material, vinyl is low-maintenance, but not maintenance-free. It has limitations as well as strengths. Vinyl is available in a full range of colors, grains, textures, and clapboard widths and modern manufacturing methods have eliminated many of vinyl's past shortcomings, including the tendency to fade. Order Material: Measure the linear footage of your home's exterior all the way around, without deducting for doors or windows. Then multiply that total by the home's height, from foundation to soffit. The resulting number is the required square footage to order. Most vinyl siding comes in 12-foot lengths. Assemble Necessary Tools: Primary needs are for a good hammer and a reliable level. You will want at least a four-foot level; a six-footer would be better, so that you can check along the entire length of the panel. Check often! A circular saw, tin snips, and a sharp knife are also needed. With a partner, you might be able to work using only a pair of ladders, but a temporary scaffold is safer and more convenient. Start at the Top: Begin work at the soffit and fascia. In some ways, this is the most difficult part of the installation because a lot of cuts and detail work are required. But, by completing the soffit first, you will gain a feel for the materials; you'll also minimize the risk of damaging installed siding by leaning a ladder against the side of the house. Pay Attention to Details: Because vinyl siding comes in differing configurations and panel widths, installation methods vary slightly for each. You'll want to study the manufacturer's specific recommendations. Work in Moderate Weather: Vinyl expands and contracts with temperature, so, ideally, you should work on days that are partly cloudy, and in moderate temperatures. If it's extremely cold, the vinyl can be brittle. Cut Short to Allow Panel Movement: Each panel should be cut approximately 1/4 to 3/8 inch short to allow for side to side movement and the normal expansion and contraction of the material. Let the Siding Breathe: For the same reason, assure that you don't attach panels too firmly to the wall. Let the strips "hang" on the nails rather than pounding nails tightly. Install Longer Lengths First: Work on larger areas first, leaving small cuts for last. 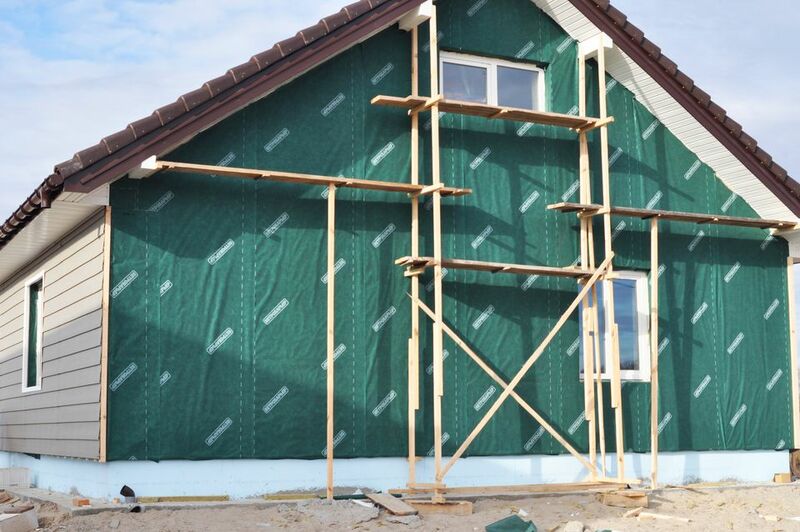 Where seaming is necessary, plan your installation so the overlapping seam faces the rear of the house, or away from where people regularly gather. The goal is to minimize the appearance of seams as much as possible. Buy a Vinyl Siding Saw for Good Cuts: Wood blades may damage the vinyl, and will not make smooth precision cuts. A professional cut will simplify installation and look better. Take Care with Trim Pieces: Spend the necessary time and effort to assure that the fittings and trim around soffits, windows, doors and foundation are all as perfect as possible. With the number of options available, it's clear that vinyl siding can be an appropriate choice, whether you choose to install it yourself or contract with a professional. As with any home material, there are pros and cons to vinyl siding, but for value and durability it is one of the best.